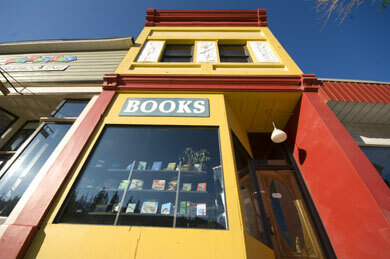 Our on-line store, powered by BookManager, enables you to browse and order millions of available titles. It is quick and simple and allows you the ease of on-line shopping coupled with the customer service and expertise of your local Bacchus Books staff. We cover the cost of shipping and you need not pay until your goodies arrive. Click HERE and follow the simple instructions to begin shopping local and online. The towering yellow walls are not the only reason we are a bright spot in Golden’s landscape. 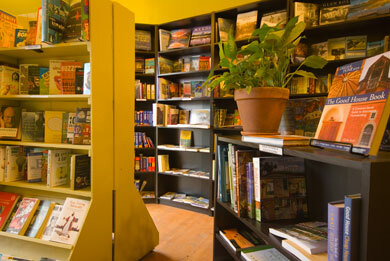 Bacchus Books and Café, Golden’s 2007 Business of the Year, offers a refuge for both the mind and the palate. Our combination bookstore / café with its sweet little riverfront patio anchors the intellectual with the culinary in an atmosphere cultivated to respect the historical yet push the edges of the modern. We feature a varied range of intriguing titles chosen both cerebrally and viscerally. We pride ourselves on loving and thinking our stock. If it is not in store, we can and will find it. Search our web store and/or contact us to help you find your treasure. We carry 10000+ used titles and are constantly updating our stock. We can and are able to track down and order out of print and hard to find titles.